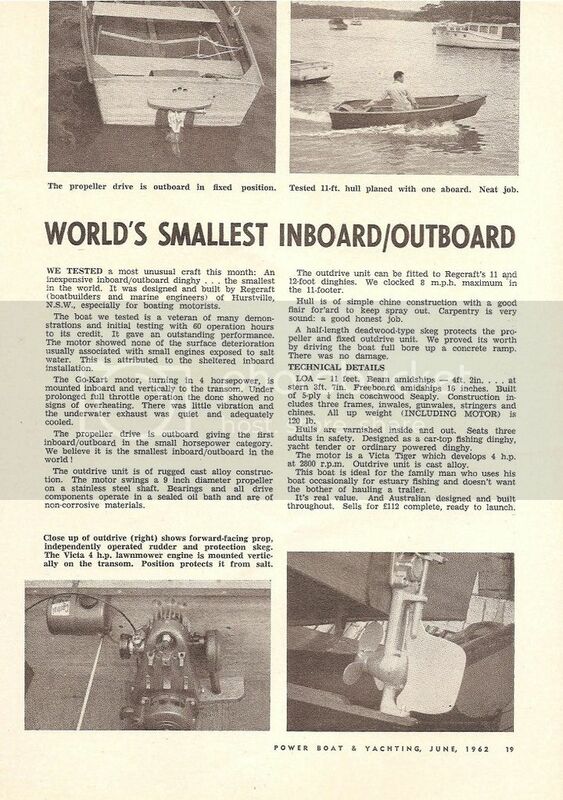 I’m sure many of you would have found the same in that there are numerous outboards brands and models not documented or discussed in Peter Hunn’s “The Old Outboard Book”. My aim here is to list 3 Australian Outboards falling in to that category in the hope that some of you may be able to provide information additional to that listed below. At this stage, I don’t have approval from the owners to post pics, so text and clues to image locations is all I can provide at this stage. Hopefully that will suffice. Comprises a vertically mounted Victa Tiger 125cc air-cooled single, mounted on top of what appears to be a generic leg. This outboard has has separate drive and exhaust tubes, with the exhaust ducted through the cav plate which forms part of the gearbox casting. The fuel tank is cylindrical (juice can style) but significantly larger than those normally found on Victa 125cc mowers. Search Saito FA-120 on Guntree.com.au for images. R.A. Wisely Co. (RAWCO) of Melbourne produced mowers and outboard conversions circa 1956. The engine and leg RAWCO products and the RAWCO name forms parts of the transom bracket casting. The lower features an interesting gearbox without cavitation plate. I am aware of two RAWCO outboards, one in Swansea Tasmania and another in Gorokan NSW. Search Google for RAWCO Outboards to see the RAWCO in Swansea and an advert for the RAWCO mower and outboard conversion. This was essentially an Inboard/Outboard unit which attached directly the inner and outer sides of a transom. Power was via a horizontally mounted Victa Tiger 125cc air-cooled single. The engine was of course mounted to the inboard side of the transom. Attached to the outboard side was a professionally cast V-shaped leg that housed steering assembly, gearbox and rather large rudder similar to those seen on early ELTO’s. The engines drive shaft and the prop shaft are fitted with sprocket, and hence drive to the propeller is via chain. 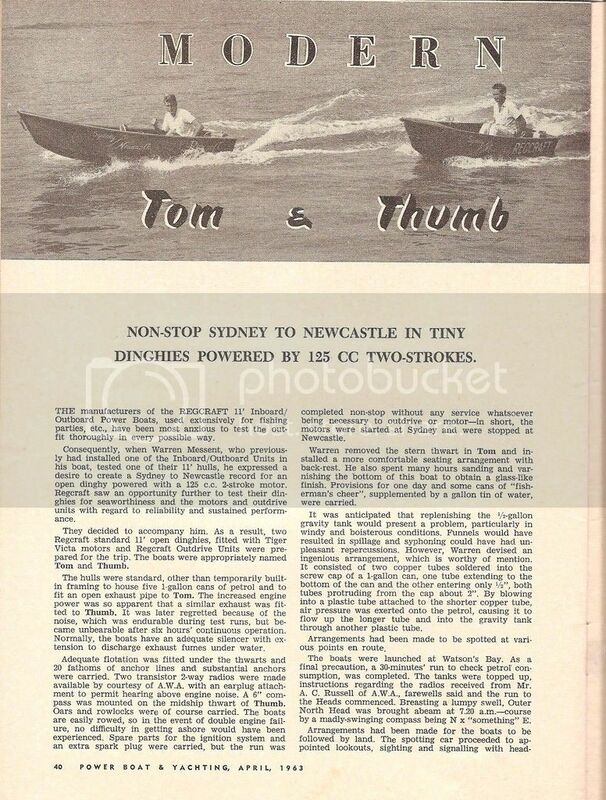 It is not known if this inboard/outboard unit was produced for the commercial market or by a boat builder in NSW exclusively for his production timber boats. Google searches won’t help find this particular inboard/outboard unit. Once I have the owners approval I will post an image and details of the boat builder here. 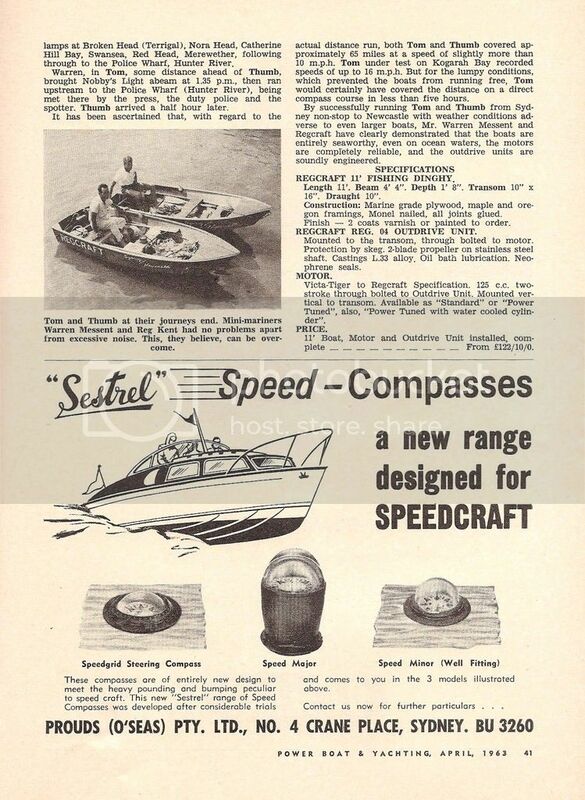 Any information about the above-mentioned outboard units would be greatly appreciated. Interesting to see what are the replies Aye. Not that you are hedging yr bet in any way of course. Just sharing the love, questions to begin with and answers (with approval) as they come. For those interested, some excellent information has been received re Undocumented Outboards No's 1 & 3 from Collector Inspector and Croweater of SOS . Many thanks to both gentlemen for their support. Undocumented Outboard No 1. is now confirmed to be a owner build using readily available parts. The 'Simplex' gearbox and join in the exhaust tube, as well as the name and model number which actually belong to a model aircraft engine gave the clues needed to establish the above claim. 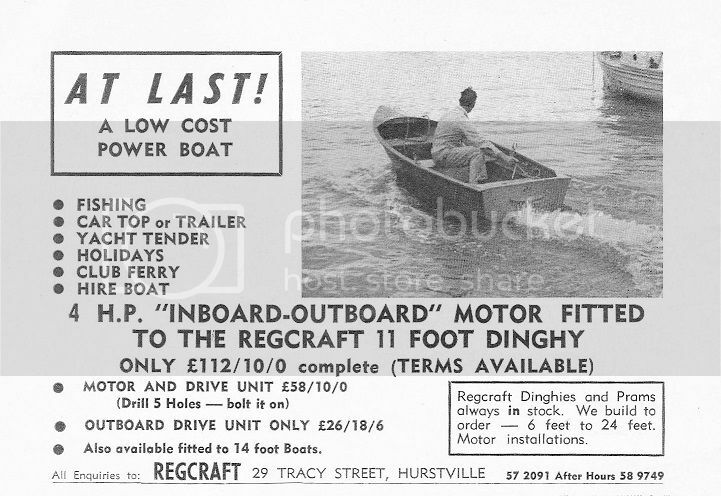 Undocumented Outboard No 3. is a Regcraft I/O unit. The articles and adverts below answer most questions about this super rare unit. Hope you enjoy the read.